Spring Body Care Switch Up with Sesderma. AD| Recently I have been an avid sufferer of dry skin, and a lot of the time it turns into eczema, usually on my hands, but recently, as in the past year, it has spread to my body too. Products featured have been gifted for review. You can read my disclaimer here. A patch here, a patch there, it's very uncomfortable to say the least! At the moment I have it on the inside of the tops of my arms, odd place for it to occur, right?! But I have been battling it with the help of Sesderma. I am so lazy when it comes to taking care of my skin, and more specifically my body. I always make sure I remove my makeup at night, cleanse and moisturise, but then it’s like I have a complete mental blank, and just don’t bother with the rest of me. 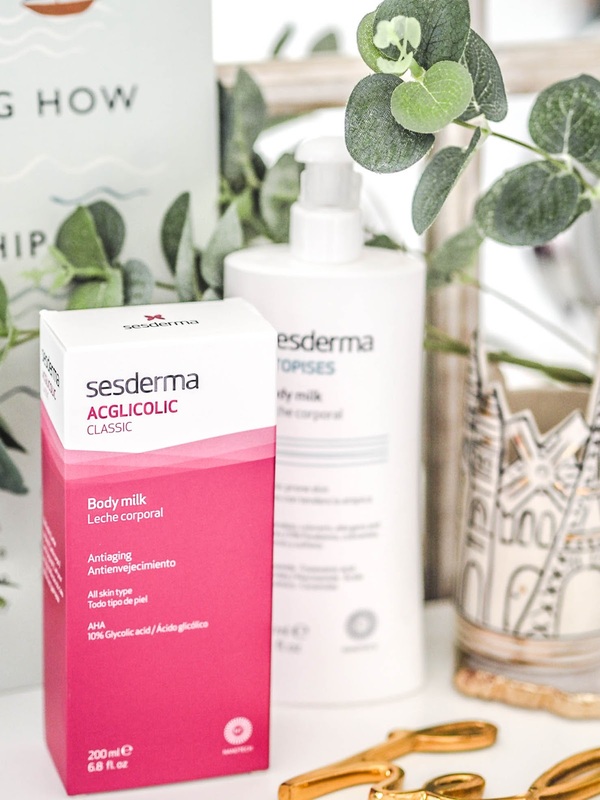 Sesderma's Acglicolic Classic Body Milk is easy because you apply it straight after a bath, or shower. I actually apply it to moderately damp skin. All it takes is a few minutes to rub it in until it’s fully absorbed, and ta da! Minimal effort for maximum results. It's a lazy (busy!!!) girls dream product because it has such a light formula. I have deliberately leave Sesderma's Atopises Body Milk by the sink so I have no excuse to apply it to my hands and upper arms every time I'm there. It is slightly scented, but not overly so. It kinda smells a bit like talc, I quite like the clean scent if I’m honest. This absorbs quickly and doesn’t leave my skin feeling sticky or greasy. It gets a thumbs up from me. I have certainly noticed a difference since I started using this to when I haven't used it in a few days. I don't think I could make this skincare routine any simpler, or quicker. It's perfect for Spring because I really feel like I am prepping my skin, and giving it the best chance of being summer ready. Do you have any top tips for banishing dry skin?